ASCO, Chicago, IL · 2018, Galon J. et al. HfO2-NP + RT bring marked changes to the tumor immune profile both in mouse model and in patients with STS, compared to RT. So far, these results show that HfO2-NP + RT induces a specific adaptive immune pattern. 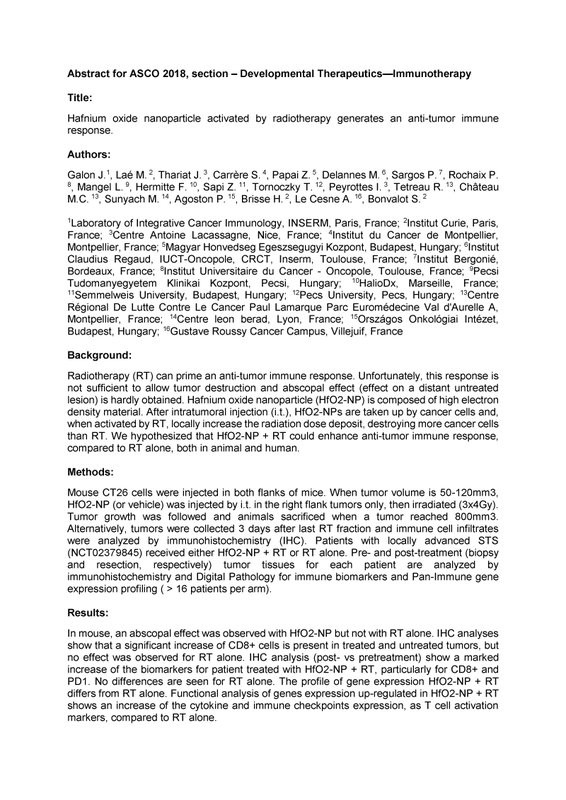 In mouse, an abscopal effect was observed with HfO2-NP but not with RT alone. IHC analyses show that a significant increase of CD8+ cells is present in treated and untreated tumors, but no effect was observed for RT alone. IHC analysis (post- vs pretreatment) show a marked increase of the biomarkers for patient treated with HfO2-NP + RT, particularly for CD8+ and PD1. No differences are seen for RT alone. The profile of gene expression HfO2-NP + RT differs from RT alone. Functional analysis of genes expression up-regulated in HfO2-NP + RT shows an increase of the cytokine and immune checkpoints expression, as T cell activation markers, compared to RT alone.